wow, I love this Doily Beret. I tend to crochet loose and the doily portion was perfect as a place mat for one of my flower pots. Just the right size and a lovely design. I am making the hat and will post it when I finish. This looks so lovely ! 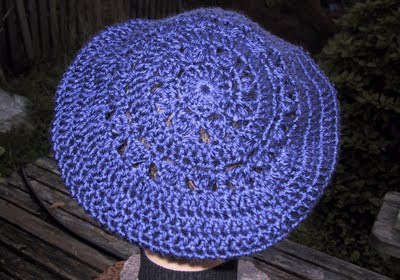 i am a beret fanatic and only just recently began wearing roll-brim hats, but this looks like one that is a "must-have" for winter and fall ( spring,too, if the weather is cool enough ;) ) Beautiful pattern !